Introducing you to Amazon’s newest addition to the Echo family: the Echo Spot. 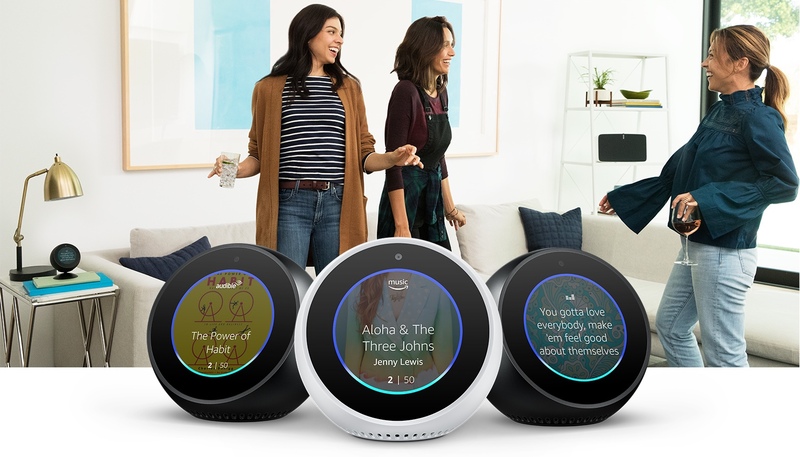 With its compact, circular shape, the Echo Spot may have the nicest design of all the Echo family. But not only is it attractive, the device is loaded with some very striking features that put’s it ahead of most members of its family. The Echo Spot looks like a soft ball cut into half diagonally. Measuring 104mm x 97mm x 91 mm and weighing just 402 grams, it is circular with a 2.5-inch, 480 x 480 pixel resolution color touch screen situated on the slanting side. The screen display is very clear and easy to use for selecting options on the device through pull-down menus. Just above the screen is the camera. Its smooth texture exterior makes it easy to clean smudges and smears compared to the fabric finish on the Echo 2. It has four microphones that enables it to pick up your voice clearly even across the room. The flat bottom enables it to sit snugly on any surface in your home or office. 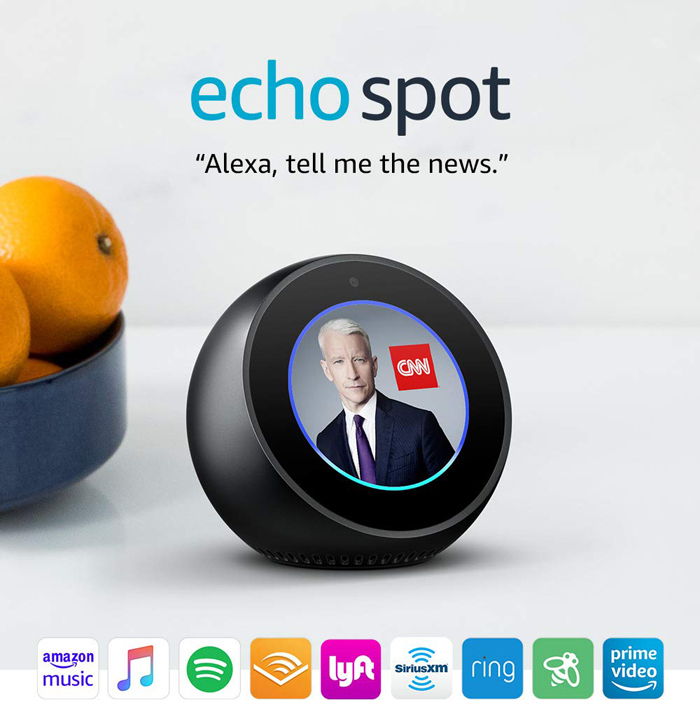 The Spot has a bigger speaker (1.4 inch) than the Echo Dot(0.6 inch) located at the bottom. This gives it a fairly fuller and much richer sound. As with most Echo devices, there are three buttons at the top – the volume up, volume down and the mic on/off button. When you turn the device on, you must turn on the mic manually to use it. The mic button also doubles as the enable/disable switch for the camera. 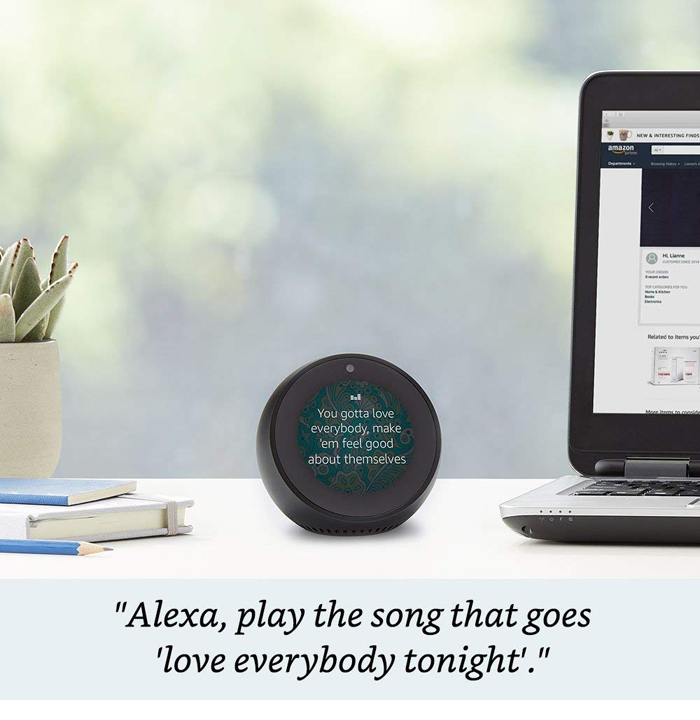 On the back, as with all Amazon’s Echo devices, is the power connector and a 3.5 mm audio stereo output for connection to external speakers, if you do not want to use the device’s internal speaker which is located at the bottom of the device. The Echo Spot is available only in two colors – black or white. With dual band Wi-Fi that supports 2.4 and 5 GHz bands, Advanced Audio Distribution Profile (A2DP) for streaming audio and Audio/Video Remote Control Profile (AVRCP) for voice-controlling mobile devices, you have seamless connection to a wide range of devices. Starting with the clock, you can select a digital or analog format, choose from different themes, background photos from Prime Photos, set preferences for home card, set do not disturb period or time to dim the clock display and so forth. You can also set various messages in celebrity’s voice or a music artist or track (Tuneln, Spotify and Amazon supported) as your alarm ringtone. You can stream music with Alexa on the Echo Spot simply with your voice. There are millions of music to choose from Amazon Music and you can also connect to Tuneln and Spotify. Lyrics are displayed (UK only) as well as album art and the playlist. With the Bluetooth functionality, you can stream audio to and from compatible devices in your home with its multi-room music features. 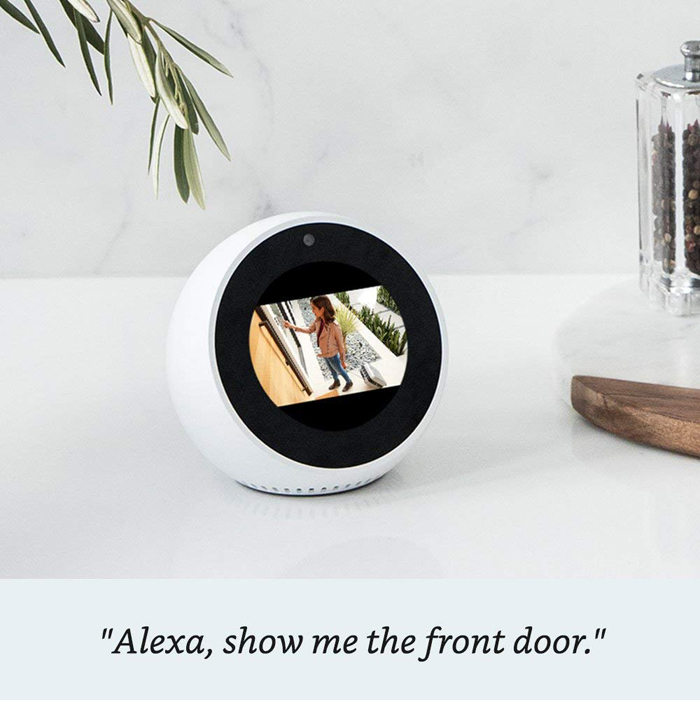 The Echo Spot allows you to voice-control smart devices in your home such as thermostats, fans, lights, TV, plugs, doors, cameras and many other brands. 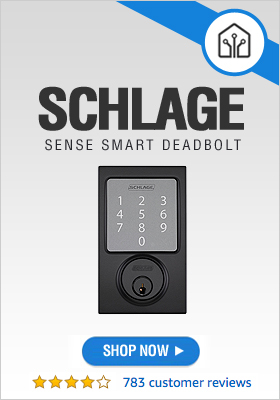 You can even connect the camera feed from your children’s nursery to the device and schedule instructions or carry out series of instructions with a single command such as “good night Alexa” and the lights are turned off, the doors are locked, the security alarm is activated, etc. – all in one sweep. Listen to local news broadcast with video flash briefing from BBC, Telegraph and others. Obtain or display weather information, show commute time, display your calendar from Office365, Outlook.com, Gmail, iCloud or G Suite, your To-Do or Alexa shopping lists. Your list items are synced between the device and the Alexa app so you can add items on the device at home and it is added to the Alexa app on the shopper’s phone. 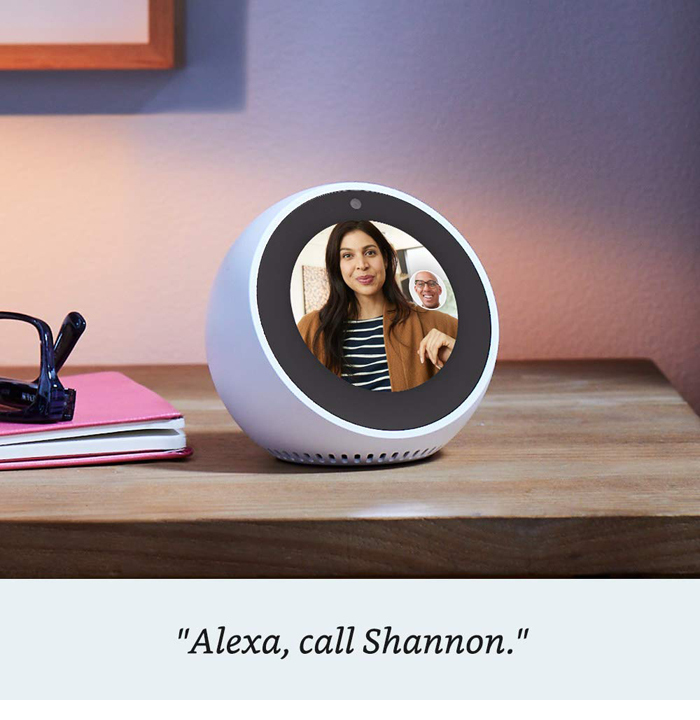 The Echo Spot drop-in feature allows you to make hands-free voice calls through Alexa to other Echo devices anywhere, or to Skype or the Alexa app. Hands-free video calls can also be made to users with Echo Show or Echo Spot devices, Skype or the Alexa app. The Spot will verify your identify and the contact before making the call. The voice connection is pretty clear and good when compared to the Google Home Mini. Just plug in, turn on and after booting, it is ready for setting up. 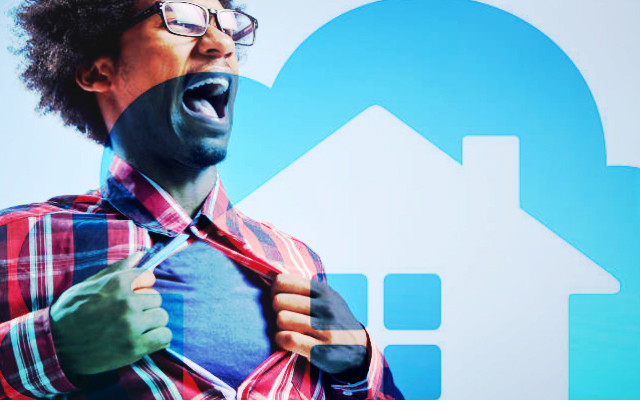 If you have downloaded the Alexa app, simply open the app and log in with you Amazon account details and the device will be automatically synced. If you have not downloaded the Alexa App, then you will need to enter the details of the Amazon account manually using the device touch screen. 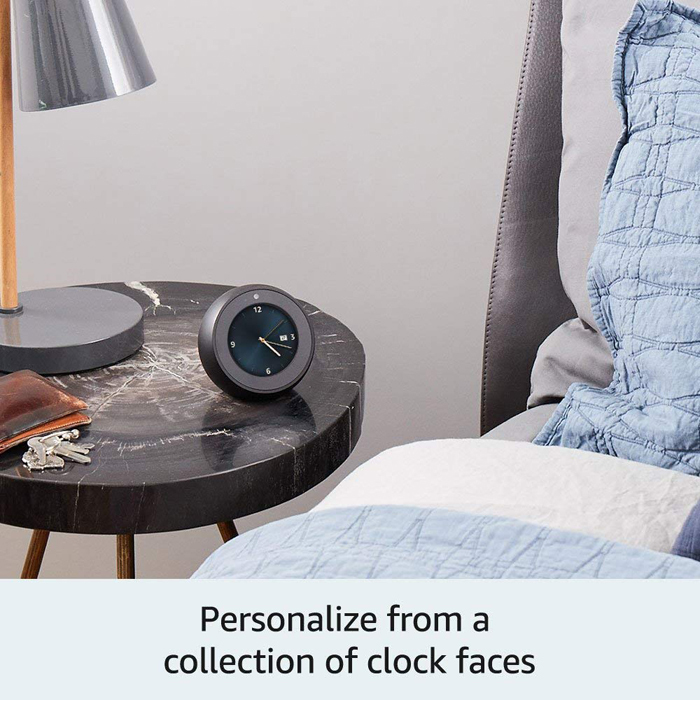 From the Settings menu, the Echo Spot’s functions can be customized to your taste and desire (such as clock format, theme, volume, brightness, photo slideshow screen saver, etc.). You can watch videos, film trailers, TV shows, make clear video calls to other Echo devices in your home or to others outside your home having compatible Echo devices, Skype or Alexa app. Among the Echo family, the Spot stands out. Its immediate distinguishing feature is its design. 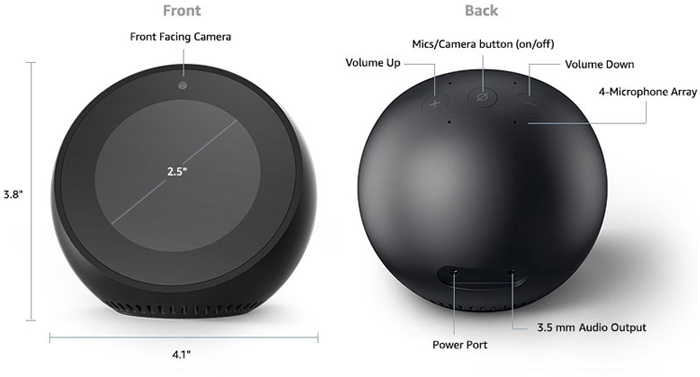 Compared to other Echo devices, its small, circular shape makes it more attractive and pleasing to look at than the cylindrical shape of the Echo or the big rectangular look of the Echo Show. But more importantly are the number of unique and interesting features that are packed into the little devices. It is definitely small but, in terms of what it can do to make your life simpler, organized and fun, it is mighty. Get Your Amazon Echo Spot Now!